It doesn't happen often but, once in a while, the Perfect Day comes along and leaves a lingering residue of contentment, inspiration, satisfaction, warmth. Yesterday was such a day. Thanks to the kindness and organisation of Naomi at Outofmyshed and Catherine at Great Dixter, I joined a small group of garden bloggers at this very special house and garden in East Sussex. The gardens were not yet open to the public (opening tomorrow, Friday 29th March) so, apart from staff and busy gardeners, we had the place to ourselves. As guests, we were welcomed with coffee and cake and a busy day had been planned for us, starting with an eagerly awaited talk from Fergus Garrett about the work that they do at Dixter. He's deeply passionate about all he and his team do so, despite his protestations of going on too long, we were charmed, amused, inspired and informed. An excellent talk by any standards and, for me, the highlight. The rest of the day disappeared far too quickly with a tour of the nursery, the house, the restored medieval Great Barn and a 'behind the scenes' tour of the garden with assistant Head Gardener Siew Lee. Every person we met spoke generously and knowledgeably about their work; as a result, I've come home with a notebook (and mind) filled with advice, recommendations, subjects to research and ideas which will be written about in future posts. But, for now, it's a dry, bright - if chilly - day in North London and I feel so uplifted and inspired by the people that I met yesterday that I can't wait to get back to work in the gardens here. That's the power of a good garden visit and the joy of meeting with like-minded blogging and gardening souls. Even the logs are happy at Great Dixter! And a fuller post can wait for another day. An ice-cream scoop is the perfect tool for removing squash seeds. Snow clinging to the roof tiles suggests a lunch of warming soups and squashes rather than salad. I haven't got any winter veg growing to fill the 'hungry gap' (last year's downpours rotted my perennial caulis, slugs got the rest) but what I do have, stored from last Autumn, are my spaghetti squashes, also known as my Squashed Pyjamas. They were one of my trophy veg last year because, after a very slow start, a couple of weeks of late summer sunshine revived their spirits and they grew almost daily, greening up the spaces between the fruit trees and producing several torpedo sized squashes before the season end. These were duly stored on a high shelf in my kitchen, probably not the most appropriate spot but it seems to have worked. I retrieved one of the smaller squashes from its lofty perch at lunchtime on Sunday and prepped it for the oven with spices and herbs. (And my pruning saw - the rind is hard.) It was delicious. A simple meal of good home-grown veggie nosh. And with the added bonus of a snack bowl of edible seeds, also oven roasted - although I pulled out a few for resowing before they went into the oven. I'm waiting for the weather to warm up to a regular 5C before I start sowing any seeds, meanwhile taking the opportunity to finalise what I'll grow in the veg patch this year. These squashes have definitely earned their place, albeit a rather large one as they need a lot of room. Last year I started them off in 3 inch pots (set the seed on its side) and found they quickly needed potting on. Treat them like courgettes and plant them out in late May or early June in a sunny spot, keep them well-watered and well-fed (plenty of organic matter before planting preferably) and have bee friendly plants nearby to guide the bees in the right direction for pollinating the flowers. Squash Pyjamas is less "floury" than butternut squash and more tasty than marrow. When cooked, the flesh shreds easily into strings, hence 'spaghetti' squash. I cut mine in half, drizzled olive oil over the top, added a sprinkle of dried herbs, some smoked paprika, salt and pepper and then an extra smidgeon of butter on the top - and then roasted it for an hour at 180C. A few slices of bacon would have only increased the pleasure. The seeds were washed of all squash flesh, dried and tossed in olive oil, sprinkled with the same herbs and seasoning as the squash and roasted for 15 minutes. These make a very, very nice crunchy snack. I bought my Squash Pyjama seeds from More Veg, a good investment at 3 seeds for 75p. In a good summer, this should yield at least 15 squashes - 5 per plant. Even in last year's washout weather, I still had 6 squashes from the two seeds that I grew; both germinated and I left the third seed as a standby which, as it turns out, was not needed. The supplied seeds are not F1 so I presume I can resow my seeds saved from the best plant, in which case my initial investment is even more of a bargain! And don't forget, if we get a good summer and the squashes fruit prolifically as promised, I can also take a few of the edible flowers to add to salads or stuff them before deep frying, as per zucchini fritters. My favourite thing at the weekend is to take five minutes to think through the day ahead before getting out of bed. (Once up, the reality of running a household can derail my objectives so it helps to have a plan already in place.) Earlier this morning, still in bed, toasty and warm, eyes closed, I could hear that yesterday's gale force freezing winds had died down so the day seemed full of potential. Having lost all of last weekend to a flu-like virus, I thought of all that could be done over the next two days. First, I wanted to visit the RHS Grow Your Own show at Wisley, followed by a brisk walk round the gardens. Second, was to get into the veg garden, dig over and replant the herb bed, plant out the two edible shrubs and raspberry canes recently bought and start to cut back the enormously overgrown shrubs in the middle border. That was enough to be going on with so I got up, full of optimism, and drew the curtains ... to be met with a view of thickly falling snow settling on the hedges. Yesterday I noticed long drifts of opening daffodils throughout the college grounds in tune with the Spring equinox three days ago. This morning, Siberian winds have taken the UK back into winter. Surely it's time the wintry weather was over? I won't be doing any digging today! I walked down to the garden to take a few snaps for posterity. There was more slush than snow but freezing easterly winds had created ice drops on the leaf tips of shrubs. Since then it's been snowing heavily all day and is just, mid-afternoon, starting to settle. Out of interest, I looked back over what I'd written in March of previous years. Last year the weather had become clement enough to have a nine hour tidying stint outdoors; I wrote about planting herbs and that garlic shoots were growing well. In 2011, I was thrilled to discover my pear trees thick with blossom and harvested Romanesco cauliflowers for my supper. 2010 saw the first of my spring posts as we'd started the veg patch in the previous year. I wrote about my trip to Sarah Raven's Perch Hill farm and Derek Jarman's Prospect Cottage, clear blue skies and eating baby spinach, beetroot and spring onions from the garden and seeing the Broccoli Raab florets forming. I remember that the entrance fee to Perch Hill was waived as the garden wasn't as advanced as expected for the time of year and rain had recently fallen so other visitors had a right old time trying to unstick their vehicles from the oozing mud in the car parking field. I wrote about chilly winds at the beginning of March in all three previous years so perhaps this Spring isn't so different, although I don't think it was this cold. Could warmer weather be just around the corner for this year as well? Gosh, I hope so! I'd show you my spuds but, really, they all look the same. "As well as tasting better than you had ever imagined a potato could ever taste, many old varieties have blessedly strong constitutions. In the slap-happy, spray-happy post-war years, this was not valued as much as it perhaps is now, when the effects of eating poisons for lunch are beginning to be more clearly understood." "Tasting better than you had ever imagined a potato could ever taste ..." Hmmm. As I read on, I started mentally to clear a space in the veg patch for some heritage varieties. There's nothing wrong with supermarket potatoes but I was enticed by the thought of growing the right potato to fit the recipe - and with superior (hopefully) flavour. Arran Victory - 1918: A rare, blue-skinned, maincrop potato with superb flavour. I'll use this one for roasting and mashing. Foremost - 1954. A first Early with waxy flesh and excellent flavour. Use for salads, baking, roasting. Linzer Delikatess - an Austrian second early; recommended to me by Pennards. Like a Charlotte but longer, thinner, smoother. Keeps well. Vitelotte - 1850. A potato with dark purple skin and purple flesh that keeps its colour after cooking. Although I'm a bit hesitant about the idea of eating purple mash, I thought this would go nicely with my purple Cosmic carrots! A main crop potato, grown in France as a gourmet delicacy but originally from Peru and Bolivia. Full bodied flavour reminiscent of chestnut. Will make very interesting chips or salads. Cherie. Allegedly a very pretty deep rose pink salad variety from France; a First Early which gives exceptional crops of oval yellow fleshed tubers with a wonderful flavour. Now doesn't that sound delightful? So much for not growing potatoes! I came home with a several tubers of each of the above varieties - at 20p per tuber, it seemed a taste challenge not to be missed. Although, in hindsight, I may have picked my spuds following my (largely unsuccessful) method of backing a horse in the Grand National, i.e. it has a nice name. Pennard's stand, sited under an art installation of 3,000 hand-wired roses. I met Naomi Schillinger a couple of years ago after realising that she lived and gardened not far from me in North London. Having followed her blog for some months, I was curious to know how she had succeeded in getting so many of her local community involved in her front garden veg growing project. The answer, discovered over a cup of tea and a tour of the neighbourhood, is that she is enthusiastic, energetic and passionate about gardening. Naomi's commitment to the community gardening project has now seen those energies channelled into a new book called 'Veg Street - Grow your own community'. A copy of the book was sent from Naomi via her publishers and it's a pleasure to see what a worthwhile endeavour this book has been. 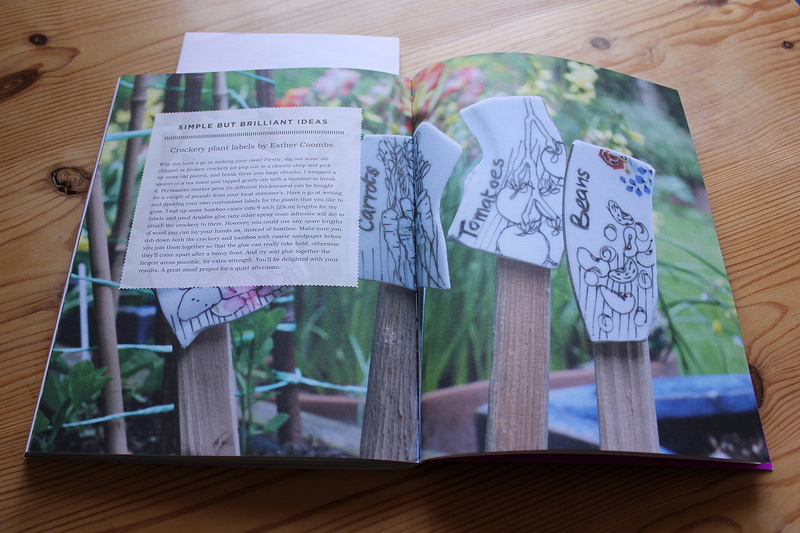 Even with several years gardening experience under my belt, I've found Naomi's book very informative. I'd go further and say it would be invaluable to anyone wanting to start an edible garden - whether in a bucket or a backyard. But the real point of the book is how the front garden vegetable project has transformed a few streets into a cohesive neighbourhood community. It's not only made it a nicer and more colourful place to live, but has made the area safer too. I found the structure of the book very helpful: it's chunked up into months of the year, with each chunk following the same format of monthly list and introduction, community corner, sowing and planting, good ideas, one pot shop and harvesting. To quote one of Naomi's headings, this is a Simple but Brilliant Idea; it makes it possible to swiftly locate areas of prime interest, although every section makes rewarding reading - and the absolute basics (soil, light, etc) are covered at the beginning of the book. Creative ideas, useful recommendations and beautiful photos - many taken by Naomi herself - abound throughout. So, with a wealth of gardening books available, what makes this one different? For a start, it's written in the first person, rather than as an informal guide, which gives it a warm and friendly tone; there's a real sense of how much fun everyone is having, the community spirit which this project has engendered and how it's all so achievable. Naomi's voice is heard throughout, imparting the full benefit of her extensive gardening experience - a bit like a cross between garden chat over a cup of tea and sitting down to read the gardening section of the Sunday supps. For those that don't live in her street and can't pop into a Cake Sunday for practical advice, this is the next best thing. So whether you want to become more confident in creating or nurturing an edible garden or you want get to know your neighbours better, this book is worth a more than a look. Who knows? It may even be the catalyst that starts a gardening project within your own community. I'll definitely be referring to my copy throughout the year; it's a keeper - thank you, Naomi! The book is available from today, 7th March. Read more in Naomi's post here. Naomi Schillinger writes a regular blog about gardening and her community at Out of My Shed.